(Boston, Feb. 06, 2016) – Bruce Schneier, an American cryptographer and expert on computer security and cyber-privacy issues, will speak at 10:30 a.m. (Eastern Time in U.S.) on Thursday, Feb. 11, on how business — especially international companies – can best address cyber-security dangers. His talk, “Sony and the future of cyber conflict”, followed by a Q&A, will be held at Harvard University’s Kennedy School as the second in a series of 12 online dialogues, sponsored by the Boston Global Forum (BGF) and focusing on “Strategies for Combating Cyber-terrorism” leading up to the G7 Summit on May 26-27. The dialogues are part of the BGF-G7 Summit Initiative. Discussants are encouraged to send questions to office@bostonglobalforum.org. Members of the Boston Global Forum’s Special Editorial Board will gather your insights and send them to the speaker. The talk will be live-streamed at www.bostonglobalforum.org. Mr. Bruce Schneier, Fellow at the Berkman Center for Internet and Society at Harvard Law School, and the Chief Technology Officer at Resilient Systems. Photo: David Brody. 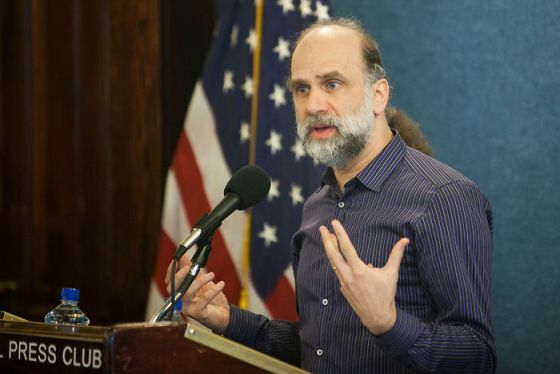 Mr. Schneier is a fellow at the Berkman Center for Internet & Society at Harvard Law School, a program fellow at the New America Foundation’s Open Technology Institute and the chief technology officer of Resilient Systems. He is the author of several books on general security topics, computer security and cryptography and a contributing writer for The Guardian.